Markus Zusak’s beloved and best-selling novel about a young girl living in war-torn Nazi Germany, who finds solace in stolen books, is finally hitting the big screen. With a stellar cast and helmed by Emmy award-winner Brian Percival, we list the top reasons we’re excited to finally see The Book Thief! 1. It’s based on the best-selling novel. Markus Zusak’s 2005 best-seller is beloved by fans globally and tells the story of brave, stubborn, and kind-hearted Liesel Meminger, the book thief of the title. In the early years of Nazi Germany, Liesel loses her brother and mother and is taken to be fostered with a German couple. Only her kind-hearted foster father and the sweet boy next door can stop her feeling lost and alone. But as time goes on and Germany is ravaged by war with the Allies, Liesel and her friends find life under the Nazi regime to be cruel, violent, and oppressive. Her only outlet is in the books that she steals and learns to read in secret. Zusak’s novel about hope in the face of war and the power of words and friendship has enchanted readers the world over and is certain to leave cinemagoers teary-eyed! As much as this is a story of war, hope, friendship and tragedy, one of the main themes of the novel is the power of stories and words. Liesel’s secret collection of books is described in magical detail and the language of the novel is effervescent with metaphors and similes that paint a wonderful visual picture. 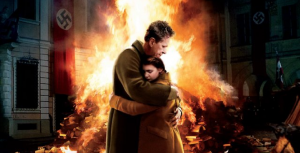 The alphabet in the basement, the book stolen from the fire, and Liesel’s inventive weather reports are all key moments readers will love to see replicated on film. The book lends itself to a visual medium, so bibliophiles will definitely want to get their tickets! The novel is set during the late 1930s and early 1940s in rural Germany and is rich in detail about the look and feel of life in Himmel Street. The film promises a unique aesthetic – historic, picturesque, and bursting with the seasons. The book follows Liesel through snow, ice, mud, spring in bloom, from cottages to mansions, and from basements to town squares full of revellers. It’s certain to make quite the visual spectacle. The most successful aspect of the novel is the curious narrator – Death, himself. Inquisitive, detached, and morally objective, Death makes for a strangely hypnotic narrator, punctuating the narrative with swift and shrewd bursts of clarity about the wider vista of life and death that the character’s lives play out upon. The film has cast Roger Allam to be the voice of death. Better known as the prickly and sardonic Peter Mannion in The Thick of It or Magister Illyrio from Game of Thrones, Allam has played characters that range from sympathetic to comic to downright sinister – which gives him the perfect versatility to play Death. Allam’s rich voice traverses cold clarity to warm compassion and in between. You don’t often encounter a narrator like this one! The Book Thief (12A) hits cinemas on on 26 February 2014.